What can you expect when you stay at Everflowing Waters Campground? One of the most tranquil and peaceful experiences any traveler could wish for. Located on the peaceful Yuba Creek, this quiet, semi-shaded, secluded campground is just the place for the camper who wants to get away from it all but remain close to the action too. Privacy and convenience, tree-shaded grassy lots and the everflowing waters of Yuba Creek make this campground a must stay location for your next vacation or weekend getaway. The charming Traverse City area with its shops and restaurants is nearby. Plus, boating, fishing, swimming, hiking, kayaking, paddle boarding, mountain biking, and two championship-level golf courses are just around the corner. 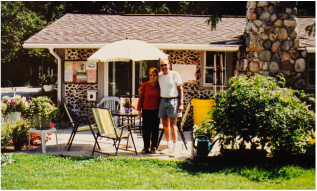 As the Christian owners of this oasis of the north, we would love to welcome you to Everflowing Waters Campground. Many a weary traveler has found refuge and relaxation with us. Whether you're passing through on a motorcycle and are only staying for one night, or you have a large RV and plan to stay with us for a week or longer, we are excited to have you. If you have any questions about our amenities, rates, or accommodations, don't hesitate to contact us.